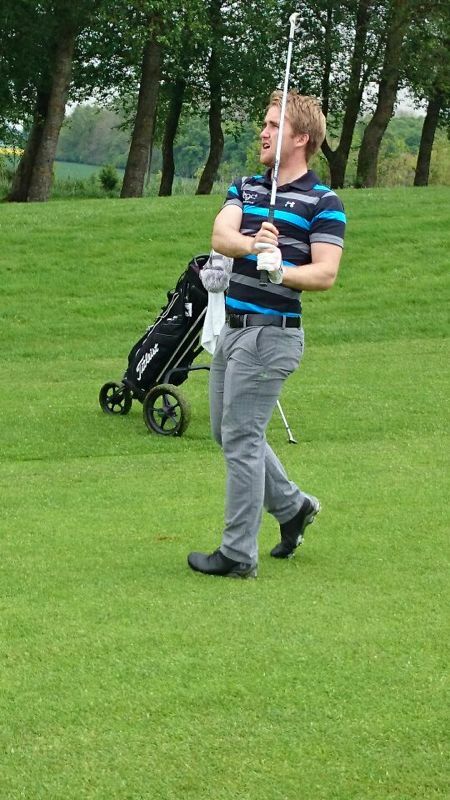 ...to the official website of Robbie Busher - Professional Golfer. Robbie currently holds his card on the Euro-Pro Tour and the Alps Tour for the 2015 season, this will see him playing all across Europe. Turning professional in May 2014, Robbie had a successful debut year and has started the new season strongly with a top 5 result at Celtic Manor followed by a 11th place at Frilford Heath a week later. Further consistent performances in the Scottish Masters (10th), the Glenfarclas Open (11th) and the PDC Open (8th) and then finishing second after a 3-way play-off at the Cobra Puma Golf Open, Robbie has made the Cut so far in all bar three of his Euro Pro tour events, and expects to make a real impact this year. His main objective is to secure a card for 2016 on the Challenge Tour. Jul 31st - finished in joint 8th place on 9 under par at the PDC Open at Chart Hills, Ashford, Kent. Jul 17th - tied in 11th place, 1 under at Mar Hall, Renfrewshire. Jul 2nd - Finished tied for 10th place on 7 under after 3 rounds in the Eagle Orchid Scottish Masters at Montrose. Jun 22nd - Played in theOpen Qualifier at Remedy Oak finished tied in 13th place on Par. 10th Feb - Tied for 4th place with -4 in the Alamos Classic part of the Jamega Pro Golf tour in Portugal. Click here for scorecard. 22nd Jan - Salgados, Algarve, Jamega Pro Golf Tour - a 4 under 69 on first day, finished equal 20th with +1. Click here for results. 15th Jan - Salgados, Algarve, Jamega Pro Golf Tour - lying equal 3rd with -5 on first day. Finished equal 14th with -1. Climbed from 1,253 to 770th position in the R&A World Amateur Golf Rankings and lowered my handicap from Plus 1 to Plus 3. Climbed to a European Amateur Ranking of 109. Vale De Pinta Scratch Competition - career best 9 Under Par 63.